Published on February 16, 2016 in Carnival, Crime in T&T, Culture, Entertainment, Gender, General T&T, Media, PNM and Politics. 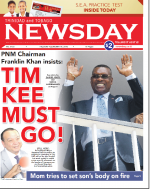 33 Comments Tags: Asami Nagakiya, Camille Robinson-Regis, Franklin Khan, Newsday, Politics, Raymond Tim Kee, T&T Govt. PEOPLE’S National Movement (PNM) Chairman Franklin Khan last night insisted that the party’s Treasurer and Port-of-Spain Mayor Raymond Tim Kee must resign in the wake of his (Tim Kee) contro- versial comments made in the wake of the murder last week of Japanese pannist Asami Nagakiya, who body was found on Ash Wednesday under a tree in the Queen’s Park Savannah. Khan made his position clear speaking also in his capacity as PNM chairman and Urban Development and Local Government Minister. He did so as Tim Kee’s intention to demit office following an emergency meeting of the Corporation did not materialise yesterday.